We are the first name that comes to your mind when you hear or plan something related to antique or vintage. Customer’s trust and their overwhelming response push us to go the extra mile. Our continuous collection and experience of 30 years separate us from the rest of the crowd. We, at Redhot-roadrelics, deal in 100% genuine signs, tin metal signs, old porcelain signs and that too in an excellent condition. We possess a vast antique advertising collection. Among those include signs of Automobiles, Oil & Gas, Soda, Fashion, Transportation, etc. to name a few. Old Porcelain Signs and auto signs add an extra charm to our collection. I would prefer not to sell those signs in the collection. However, everything comes at a price tag, and we will price these at a “don’t want to sell price.” Remember these estimations are provided only to serious collectors. Our collection consists of mostly porcelain, great rare advertising signs like , Coca-Cola Signs, porcelain neons, neon clocks, etc. in excellent condition. Other signs include Oil & Gas brands like Shell, Mobil, Texaco, Husky, D-X, Motor Oil, Gasoline, Sinclair, Clarks, Lighting, etc. 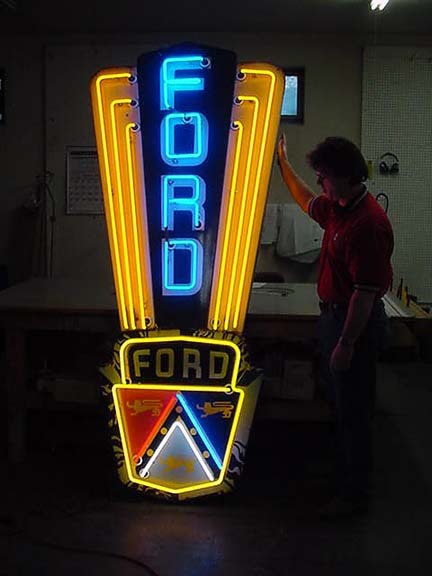 We have a massive collection of car brand signs. Few of them include Studebaker, Willys, Pontiac, Ford, Buick, Chevrolet, Oldsmobile, Marmon, Nash, John Deere, Hudson, I.H., Jaguar, Dodge, Plymouth, Chrysler, Rambler, Jeffery Four, Valiant, etc. The broad collection we are talking about took 30 years to reach here. Right from my teenage, I was fond of collecting vintage signs. We deal in Buying selling, collecting, trading Old Antique Collectible Vintage Signs and Tin Metal Signs. Due to durability and low price, a tin metal sign is hugely popular among enthusiasts. It comes in various shapes, color, sizes, art, brand. However, experienced and serious collectors have their own taste. Old Porcelain signs are the favorite among them. So, our huge collection is capable enough to satisfy the need of enthusiasts as well as serious collectors. Old Porcelain Signs, Vintage Signs, Tin Metal Signs, Old Antique neon Signs are available in huge varieties and quantities. Not to mention, that lithography art on tin metal is the most prominent pick of the season. When it comes to craze, lithographed tin metal signs give fierce competition to porcelain signs owing to its beauty. We have tried to compile some hand-picked photos for our viewers. However, keep visiting us as we update our page regularly to give you a chance to pick your favorite sign. Those planning to design their garage have too much to explore here. The collection has various transportation advertising signs. Like trains, ships, cars, buses, boats, plane, truck, etc. Some of the famous airline companies signs like TWA, United, Southwest, Northwest are available. Plane manufacturing companies signs like Boeing, Cessna, Piper Cub, Beechcraft and hundred others is a part of our collection. Famous Bus signs include Jefferson Lines, MTA, Trailways, Greyhound. Railroads implemented signs for their various companies like great Northern, Triangle Lines from Chicago to St Louis, Soo Line railroad, The Transcontinental, short line and a dozen others. These all are available with us in various shape, size, color, art, brand. Our is the place where you can get your dream signs. Build your own vintage collection. We will surely love to help you during that course.